You are guaranteed an action packed visit of fun, exhilaration and excitement on the safest site in Ireland. Paintball is not just a sport for the “Rambos” of this world, paintball with Westport Wargames is a well organised, safe and exciting action sport that appeals to individuals of all fitness levels and both men and women find it equally as enjoyable. It is the ideal choice for a Stag or Hen Party, we cater for both large and small groups and are open seven days a week- early till late (we are also floodlit for those dark winter evenings!!) Whatever the weather we aren’t afraid to go to battle. In fact we find the rain adds to the fun!! Birthday parties or family get togethers’ are a common occurrence at our venue and due to our flexibility and experience we are also a popular choice for corporate outings be it as a team building exercise or as a thank you to some valued staff members, especially at Christmas time. We have an exemplary safety record and our staff hold occupational first aid certificates issued by the Irish Red Cross Society. 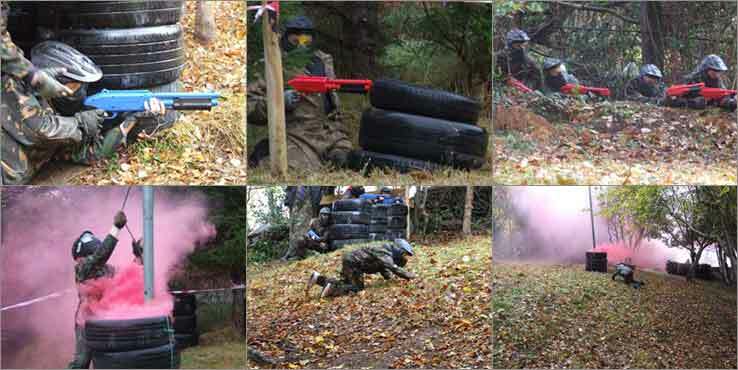 We are also experienced in catering for groups with special needs and are happy to work with organisers to ensure everyone has a fulfilling experience here at Westport Paintball Wargames. A typical outing with us begins at either 9:00am sharp or 12.30pm however we advise players to arrive at least 15 minutes prior to these times to ensure registration forms are completed fully by the entire group. Once registration forms have been completed, each player will be issued with all the equipment they need for the games and given a brief demonstration on correct use of same, their hopper will be pre-loaded with ammunition and extra ammunition is available as and when required during the games. Splatball is a fantastic way to experience all the thrill and adrenaline of Traditional Paintball with none of the “pain”!! Played outdoors in woodland and fields, a great selection of game zones with missions designed to test your strategy and skill. Experienced marshalls will guide you to victory during two hours of action packed fun! 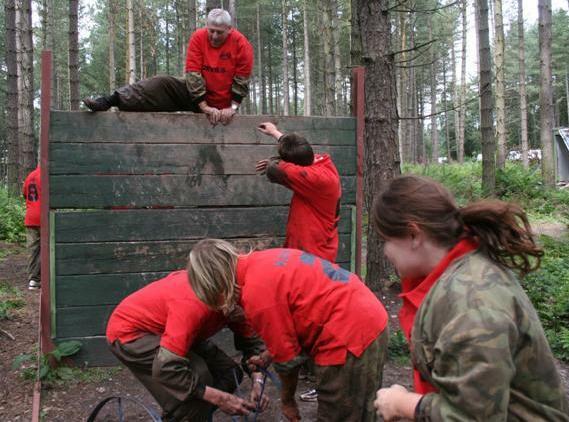 Can you all stop laughing long enough to balance, climb & clamber across our Assault Course….With over ten challenging elements rain will not stop play here!! Your against the clock and you must complete each element fully to be in with a chance of getting on the leader board….Chicken out and you’ll lose points for your team! Give the bride a day she’ll remember!